If you take a look at the slot machine games around, you’ll notice that all of them have the same basic gameplay rules. Thus, it is the graphics, sounds, animation and theme of each slot machine game that makes it different and unique. If you’re bored of playing regular slot machine games then you can switch it up by trying out the Ariana Slot Machine game developed by MicroGaming. 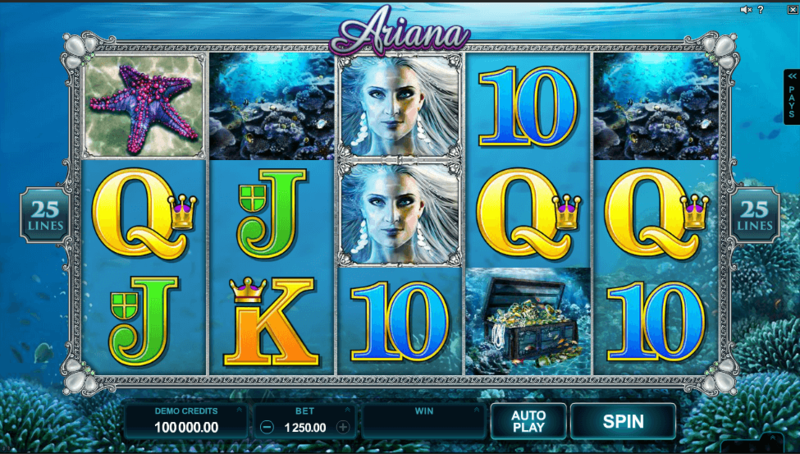 With underwater kingdom as its primary theme, this slot machine allows you to have a fun aquatic adventure with goddess Ariana. True to its theme, the game features majestic sea dragons, starfishes and beautiful coral reefs. The game is very straightforward. The playing panel features five reels and there are twenty five pay-line games to try out. What’s special about this game would be its expanding stacked symbols. This appears both in the base game and the free spins round. The first reel of the screen is very special as the symbols on this reel are stacked symbols. When stacked symbols appear in regular rounds, the other symbols present on the screen which are alike would all turn into expanding symbols! There are some underwater audio effects played during the gameplay when the player spins the reels in order to enhance the theme of the game. The Ariana Slot Machine game is packed with special features as it does not hold back when it comes to spewing payouts! Although there are no bonus games offered, the slot machine game keeps its players satisfied with free spins round, stacked symbols and expanding symbols. All of these lead to big wins. The free spins can be activated while playing the game. There is also something known as scatter wins. These are triggered when one manages to spin five starfishes anywhere on the reels. In addition to free spins, scatter wins also offer a grand prize of 10,000 coins! Although this generous game may not have a progressive jackpot feature, but one can definitely win as many as 30,000 coins with the free games, expanding symbols and stacked symbols of the game. The highest fixed jackpot is 800 coins. If you manage to get five reels full of Ariana symbols, which are the highest paying in the game, then you can get as much as 200x your bet amount! The symbol replacement feature of Ariana Slot Machine game is what sets it apart from the crowd. Although the audio effects and animations can be improved, the graphics of the game is spot on. In conclusion it can be said that this game has all the features or markings of a decent slot game. 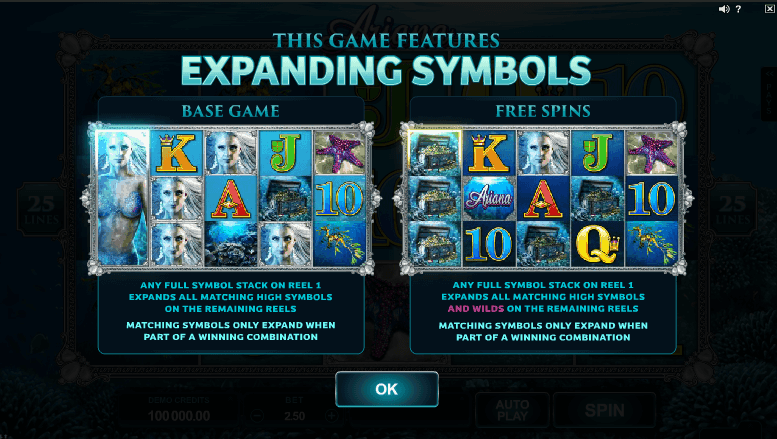 Plus, with an uncommon underwater theme, this slot machine game definitely promises a fun time to the gamers! There are two ideal websites where you can try out this exciting underwater-themed slot machine game. The website Jackpot Paradise is preferred by many for Ariana Slot Machine game because it offers a USD 200 welcome package and the players get one hundred free spins! Another good website for this game would be Vegas Paradise. Just like Jackpot Paradise, this one too offers 100 free spins. In addition to this, Vegas Paradise also offers USD 200 bonus.